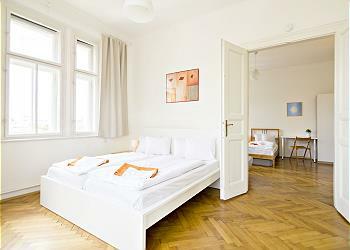 Moldau is a calm, pleasant and affordable apartment in the heart of Prague. 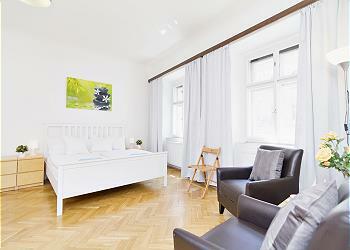 It is situated near the Vltava River, 20 minutes away from Charles Bridge or the Old Town Square. The apartment is very cozy and comfortable enough for 3 to 5 people. It is one of our most affordable apartments. 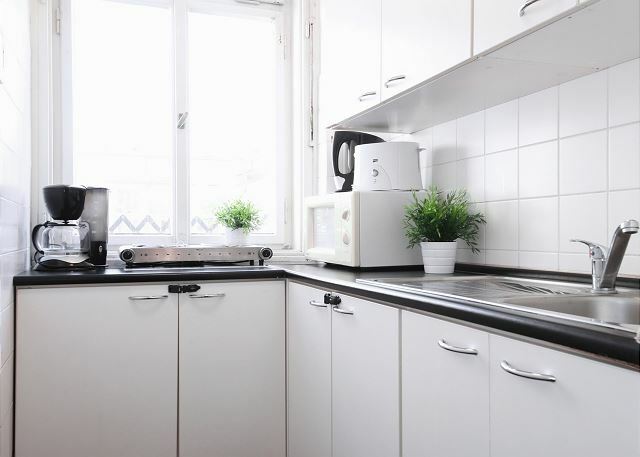 There is a kitchen which is not very big but is well-equipped with everything essential (coffee maker, microwave, toaster etc.) Moldau is located two minutes away from Klimt and Smetana, which makes it an interesting choice for bigger groups. 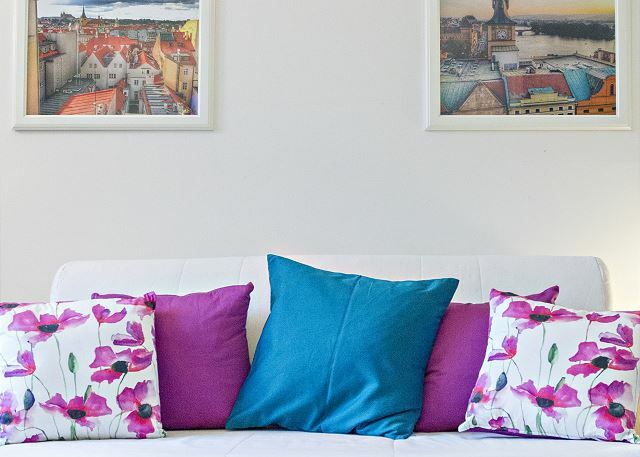 Thanks to this apartment, you can fully enjoy every bit of Prague. 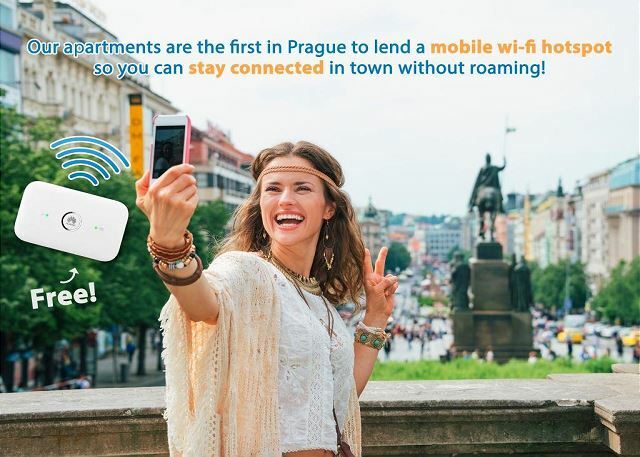 As all our other apartments, Moldau has high-speed internet connection, great for work or just keeping in touch. The apartment is non-smoking. 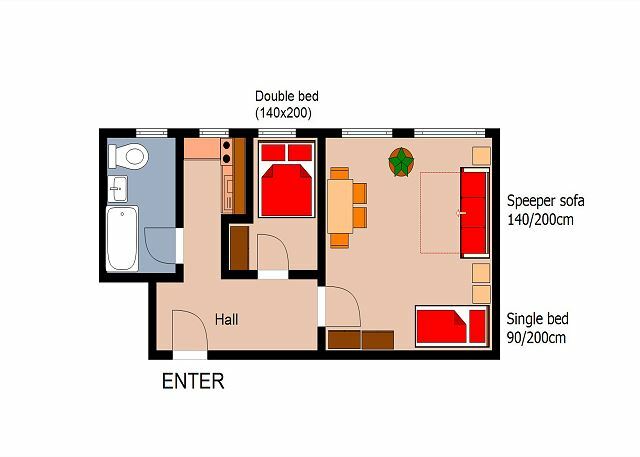 If you want a better look at Moldau, scroll down to view the “floor plan”. The street was named after a former health insurance company in the 20.century. Nowadays there is a faculty health center. The street was founded in 1928 when it connected Klimentska Steet and the waterfront Ludvika Svobody. During the occupation the street was renamed “Wettenglova” after a burgher family who lived in Prague in the 16th and 17th century. From the 1945 the street took on its previous name. On your way to metro Florenc, you can notice Saint Peter’s Church. This church was built in the 12th century as a roman bazilika, but as the years went on it was renovated in a gothic style. It has been said that there was a rich greedy civilian man buried in the cemetery, who ignored his relatives on purpose so he would not have to share his wealth with them, he even slept in a cheap coffin instead of a bed. After his death his relatives searched for his belongings but never found anything. One day a poor parish clerk saw a gold light near the grave. He then dug the coffin up with his son and found money and jewelry under the man’s pillow; he then divided the property between the poor. Appartement très propre et bien situé. Tout se fait à pied. Nous avons apprécié l'attention du champagne pour la fin d'année. Le personnel de Renta go est au petit soin et réactif à toute demande. Was good , but one of the bedrooms was so small that almost we could not fit in. Alles prima, sauber und schön. Tolle Lage. The apartment is spacious, bright and silent. The forniture is very good. A lot of mini market nearby. Ten minutes walk to the old town square. Very recommended to families with children. Great organisation by rent & go. Appartement conforme à la description, trés bien placé et fonctionnel. Seul (petit) bémol, le wifi n'a jamais fonctionné mais ce n'est pas le plus important. Overall we were very satisfied with the apartment. It was exactly as you represented it on your web site. It was conveniently located within minutes of great restaurants & major attractions. Anything we did we walked to it. The apartment was hot (July) and does not have air-conditioning but this was disclosed to us prior to our booking. Overall very pleased with our stay. The only unfortunate thing that happened was that our taxi driver that we had prebooked did not show up to the airport. This was inconvenient to say the least. Apparently he marked it for the following day. Other than this issue, I would definitely recommend the Mauldu apartment for a convenient and clean place to stay. Соотношение цена-качество отличное, месторасположение квартиры, оснащение, отношение фирмы к клиенту самое лучшее!! Рекомендую всем! La situation de l'appartement est bien placé car proche à pieds du centre ville, y compris pour les visites, restaurants et activités. The apartment was excellent - comfortable, clean and well stocked with many things to make my stay comfortable and efficient. The RenteGo rental company made sure that everything was clear and we had a great stay. The location was very good, the apartment big enough (compared to other European similar apartments we stayed before!) and everything was clearly noted and explained, avoiding confusion and/or issues. The only minor inconvenience was that it was not quite properly vacuumed, there was plenty of dust and dirt in several places - could do a better job here. Overall, a great stay at a great price! Will definitely rent again in the future! Everything was as advertised. No gimmicks, no jokes, no fake promises. Everything was great,comunication was easy. Thank you so much Ilan! Decide to hire the appartment from this company because of great experince in the past. got the same experience now. All the ladies are very kind and helpful. We loved our stay in praha. 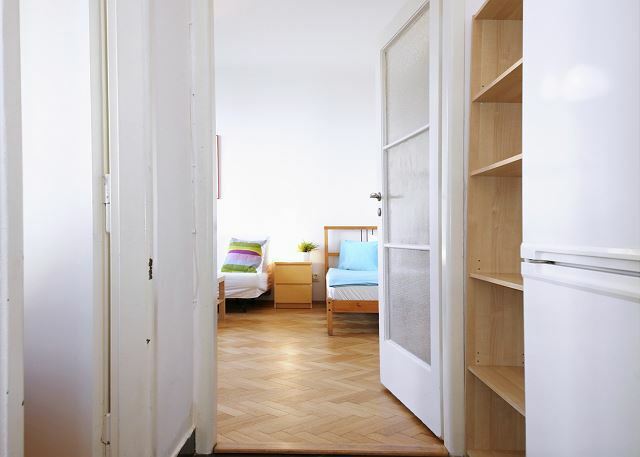 The apartment is perfectly located in the new Town and just a few blocks from the well known dlouhá Street. We are satisfied with apartment everything matched the photos and the description. 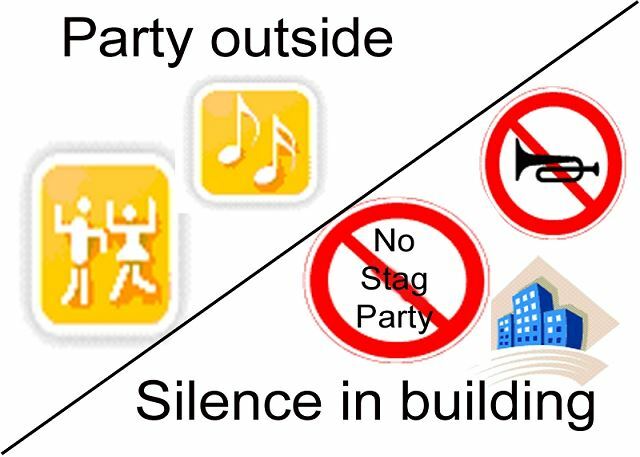 We strongly recommend it for a group of 4 or less people. Thank you for sharing your review, we are glad you were satisfied with our company and we'll be happy to host you next time you're in town! Super séjour appartement bien aménagé et grand.petit supermarché justaucorps à côté. The location was excellent and the apartment was very nice and extremely clean, also ideal for 5 people. Rentego is a very serious and professional team. Many thanks for your kindness. Great experience!! Nous avons apprécié le calme et la propreté de l'appartement (lits faits pour 5 couchages, linge de toilette fourni). Nous avions bien reçu la clé de l'immeuble par courrier et nous n'avons eu aucun problème avec le code. Seule la télécommande de la télé ne fonctionnait pas. Des mini-markets ouverts tous les jours jusqu'à 22 h sont à proximité ainsi que des restaurants et des magasins. Prague est vraiment une très belle ville animée et nous avons effectué un agréable séjour. Appartement idéalement placé, à 10mn à pied de la Vieille Ville, avec des commerces (épicerie, supérette...), des restos, des bars et cafés très proches. Très calme, voisinage sympathique, appartement bien pratique et propre, avec le nécessaire fourni pour un premier petit déjeuner avant de pouvoir faire les courses (thé, café, cacao, céréales, sucre, miel). Juste 2 bémols : le linge de lit ne semblait pas "frais", et il manque un porte-serviette ou des crochets, ainsi qu'une étagère (pour poser les nécessaires à toilette) dans la salle de bain. Gros plus : le wifi dans l'appartement, et surtout le wifi mobile ! En bref, séjour nickel !!! Good review but not for us. I was expected much better. The floor was dirty and duvet smelt not fresh. Thank you Kazuyo for your review, we will check it with our cleaning team. 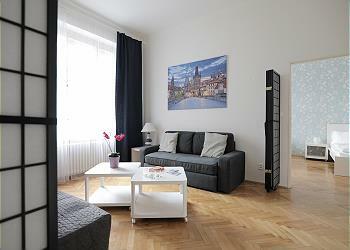 The flat was as described on the website, well located near the town center of Prague. Rentego is a very serious company and I would recommend them to friends or to my family without any problem. We are happy you enjoyed your stay in Moldau, Caroline. Thank you and see you soon! Sehr empfehlenswert wenn man preisgünstig, sauber reisen will. Praktisch organisiert, für 5 Luite eher eng, aber sauber. 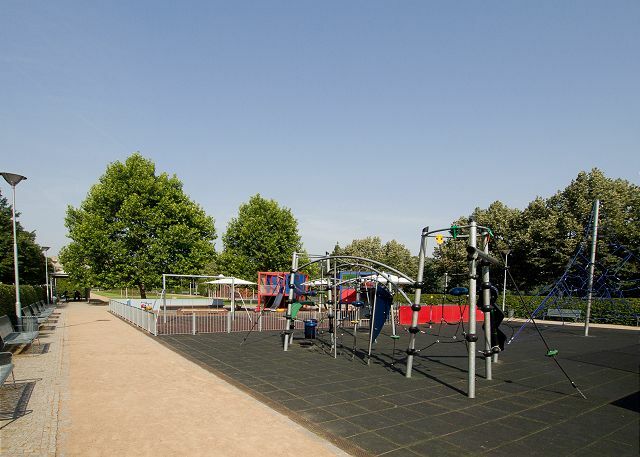 Tolle Lage mit Kindern, da Spielpark vorhanden. 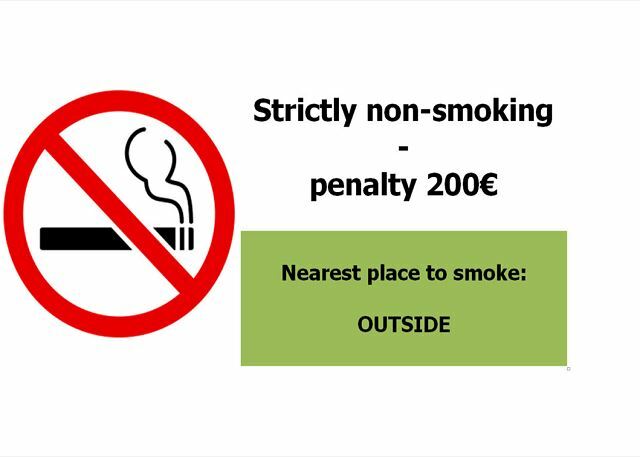 Idéalement placé (proche de tout) très calme donnant sur cour intérieur donc pas de vue. Nous avons été enchanté de notre séjour avec rentego. Services réservation efficaces, renseignements précis, accueil dans l'appartement à notre arrivée. De plus l'emplacement est parfaitement central et l'appartement très confortable. We really enjoyed our stay in this flat. It was clean and tidy, there was everything we needed. The building looks quite old, but the flat is based close to the centre. Also thanks for the nice and friendly contact in perfect German language with Rentego. My holiday in Prague was great and confortable. The apartment is located 10 minutes from the centre, and we moved only on foot. The property was very clear and the description on the website is very accurate. If I came back to Prague I'll call you without hesitation. Thanks for all. 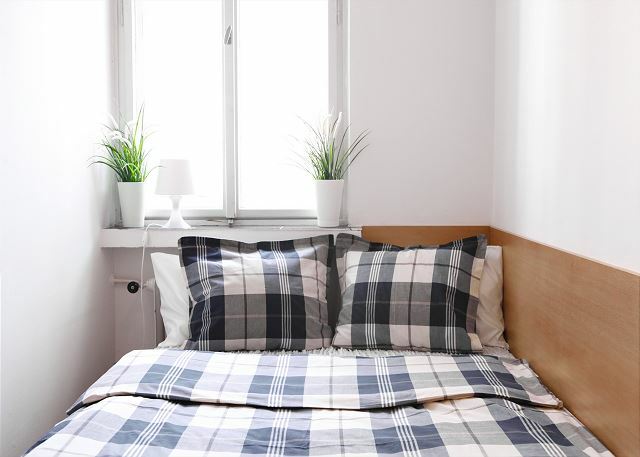 Appartement is in a great location, under 10 mins walk to the Old Town Square. Great communication with managment team, very helpfull! Thanks a lot for sharing your nice comment, Edgar. We would be happy to have you here again! Loved it. Scenery out of window had a great old touch. Beds were comfortable. Pillows genourously provided and the appartment was clean. Two friends, arriving via train, want to explore Prague. A 15-minute walk from the train station and we arrive at Moldau. The instructions lead us straight to our door, and inside is a very basic, but perfectly acceptable apartment. We drop our bags and head out to see the city! gut zu Fuss erreichbar war. Ebenso waren die Busse und die Metro in der nächsten Umgebung. Bäckerei, Einkaufsgeschäfte und Restaurants nur wenige Minuten von der Wohnung entfernt. Great experience! To do it again ! Thank you very much, Estelle! Nice apartment, calm and close to the center, perfect for 4 persons. C'est la première fois que nous utilisions rentgo tout était au rendez-vous : propriété calme, propre, près des lieux touristiques à un prix abordable. IL manquait juste la lumière dans la sdb. Nous recommandons. Nous avons apprécié notre séjour au Moldau. 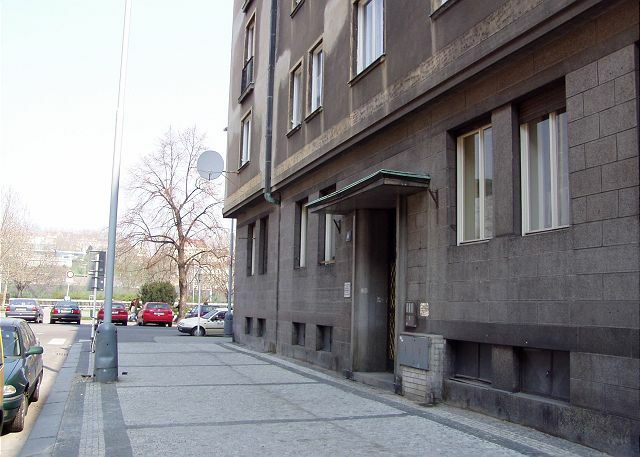 Cet appartement est situé dans un secteur tranquille et à proximité du centre ville de Prague. On y est confortable, sauf pour la qualité des draps et du matelas de la chambre pincipal (qui semble être un futon). Autrement, c'est très bien. L'immeuble est à 10 mn à pied de la station de métro Namesti Republiky et à 20 mn de la place de la vieille ville. Si vous n'aimez pas marcher, des tramways passent à proximité. Pour le shopping, on trouve également des commerces pas très loin (Palladium). L'appartement est simple avec des pièces assez petites (sauf le séjour) mais c'est fonctionnel et on y trouve tout ce qu'il faut pour passer un séjour agréable. La connexion Internet haut débit (Wifi ou cable) est un plus appréciable. Je recommande donc cet appartement. Very good location, well furnished and clean. The cheap price doesn't mean bad quality ! 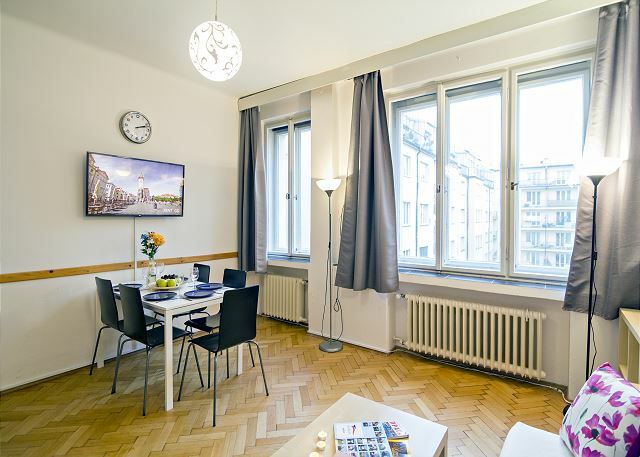 In Praga as a "praguense"
Yes, our stay in all respects was very good, both in terms of the overall condition of the apartment as the location in the Stare Mesto neighborhood, close to several places of interest and tourist trade facilities (shopping, markets, restaurants). 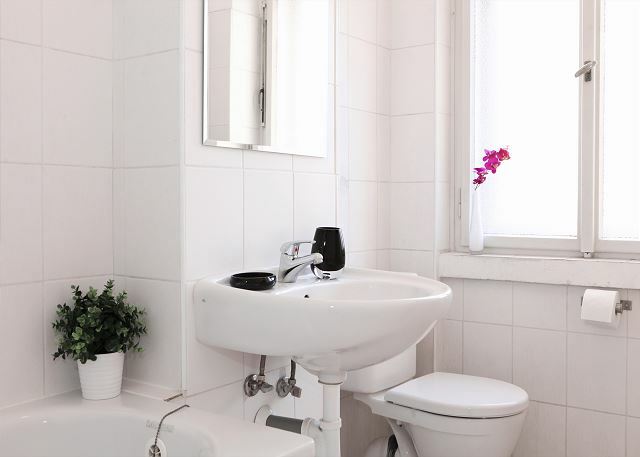 The only exception was in relation to the overall cleanliness and maintenance of the building. Also missing is a curtain in the guest room. Great location. Building very bleak. Entrance area of building dirty and smelling of cigarette smoke. Furniture and fittings, drapes etc. of low quality and needed renewal. 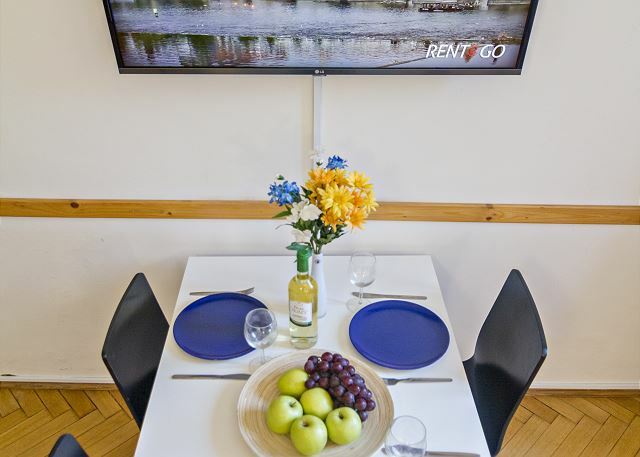 Website photos were creative and glamourised the apartment. Very clean inside apartment. Freezer totally frosted up. Despite these comments we enjoyed our stay. 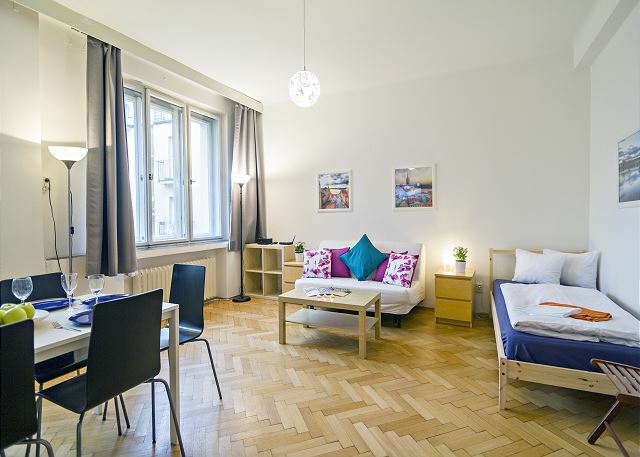 We found the accommodation at Moldau prefect for our short stay in Prague. 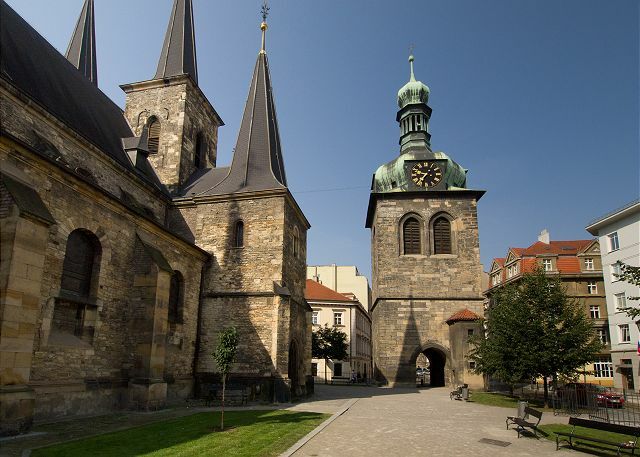 Moldau is located very close to the Jewish quarter in Prague and the majority of the major attractions are within easy walking distance. The wifi was brilliant as this kept us in contact with the world outside of Prague. A little apprehensive at first after receiving the key to the entry door in Australia, however everything worked perfectly. 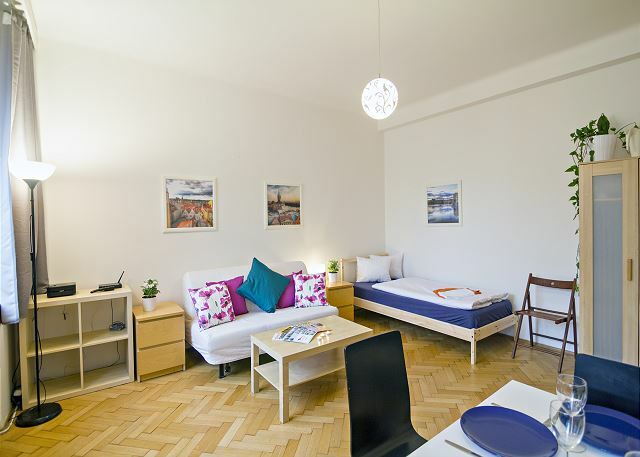 The flat is neat, tidy and comfortable at an affordable price. Thank you rentego! We only stayed a night but the apartment was clean, close to the center, and very modern. We were only two people but I think it could have easily slept 5, if not 6, people. The staff were very helpful, and even let us check out an hour late because our departure was delayed. But don't try to get boiled eggs. Getting water to boil in the kitchen is just too long..
Nice place, close to everything by walk, spacefull living room, safe quiet place. Appart nickel, site tres pro !! 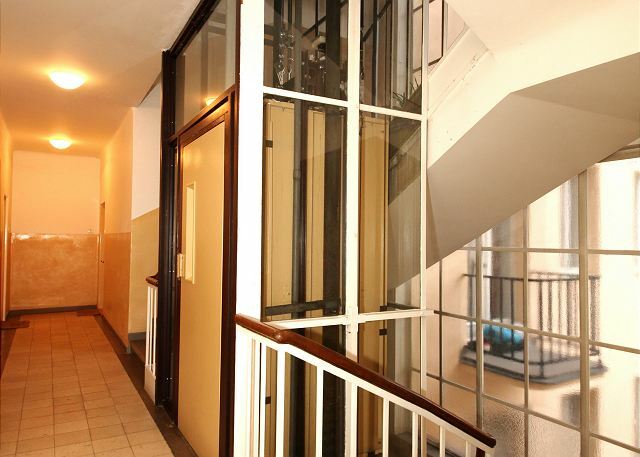 Appart Nickel, location et site tres pro !! The Moldau apartment by Rentego was almost the perfect stay! The customer service was fantastic and the apartment was nice - not luxury, but perfect for a couple over the weekend. The only thing keeping our experience from 5 stars was that there were a couple of hairs (not the long kind) in the bathroom tub and the shower head did not have a mount in the wall, which makes trying to wash your hair interesting. Make sure to ask for a driver to take you to/from the airport. Ivan was very friendly and the cost is hard to beat! Booking through rentego was easy and efficient. The apt had everything the ad advertised. Beds were comfortable and clean. The washing machine and drying rack came in more handy than anticipated! This apartment is indeed very close to the center. The description presented on the site - corresponds to reality. Among the shortcomings can be noted the lack of air conditioning. The rest - all well and fully complies with the spent money. j'ai apprécié l'appartement Moldau pour son calme, en étant un peu éloigné de l'agitation mais à 10 mn à pied de la Place de la Vieille Ville. Prague est de plus en plus belle mais il ne faut pas qu'elle soit défigurée par les excés du tourisme. 9 excellent days in Praha! Very nice, all of us were satisfied, the location was the best advantage, the only thing that annoyed us a little was the double bed/couch that was moving all the time because of the wheels! Except for that, everything's perfect!!! Thank u really much!!! A very nice stay with a team really ready to help. appartement bien situé, super calme, propre. Une organisation impeccable pour les clés et les commerces à proximité. surprising town, very interesting historically speaking.